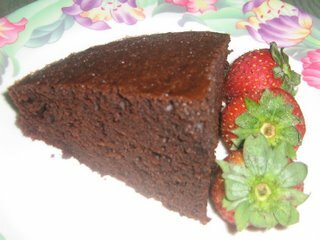 Last nite, I made Zaiima's Steamed Chocolate Cake. Why Zaiima? It is named after the originator I suppose. This cake is supposed to be steamed as the name suggests but since I do not have a big steamer that could fit my tin, I decided to bake it in the oven using a "waterbath" (i hope this is the correct term). The cake really turned out nice, rich and chocolatey but the only minus point was that the top of the cake cracked. Hmm .. I really wonder what went wrong. I'll definitely ask around if they could help me with the answer. In a saucepan, over a small fire, mix cocoa, coffee emulco, sugar, evaporated, condensed milk, butter and oil till everthing dissolves. Turn off the fire and let it cool. Sift flour, baking powder and bicarbonate of soda. Beat eggs and add it to the chocolate mixture. Then add flour to this mixture and stir well. Pour into a baking tin, then put in over a roasting tin and pour boiling water into the roasting tin. Reduce the temperature to 160C and bake for 55 - 60 mins or until cooked.